When you buy Roasted Peppers in a jar, they come preserved in a liquid. In addition to wondering what added salts and chemicals might be in that liquid, I find that it completely changes the texture and flavor of the pepper. Given how simple it is to make my own Roasted Peppers, I much prefer taking the time to do so. Try it yourself and taste the difference –I promise you won’t go back! 4. 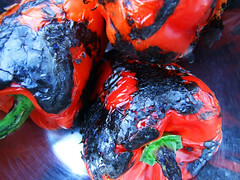 Once the peppers are completely charred, remove them from the oven and place them in a bowl.